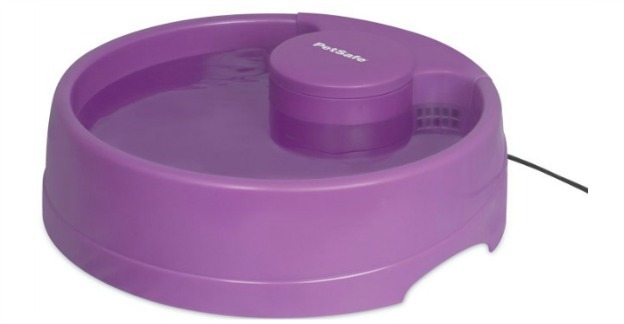 Petsafe Current Circulating Pet Fountain Just $24.18 Down From $39.99! You are here: Home / Great Deals / Amazon Deals / Petsafe Current Circulating Pet Fountain Just $24.18 Down From $39.99! You can get a Petsafe Current Circulating Pet Fountain right now for just $24.18 – down from $39.99! Petsafe sent me one to try out on our Molly. When we first got Molly from the local shelter she was afraid of everything – even the back door! I had to put a leash on her and walk her in and out of the back door for an hour until she felt safe enough to go through it without the leash! So, I was a little concerned when they sent this because it has a motor in it that circulates the water to keep it fresha nd I was nervous that she would be too afraid when she heard it or saw the water moving. But, she took to it like a pro, right off the bat! It’s super quiet so that didn’t worry her and the fact that the water keeps moving and doesn’t get stagnant makes us happy. Her water bowl was often just yucky if we forgot to change it pretty often. With this Petsafe bowl it is always moving so it’s much better for her, too!